Editor’s note: The ASTM F06 committee has approved changing the F2170 standard from 72 to 24 hours for a final, official reading. This still has to be published by ASTM so wait until the official release before using the new standard, but this is excellent news for users of the Rapid RH®! This article was originally published in Concrete Construction (Nov-Dec 2017 issue). It’s a well-documented fact. Installing a finished floor over a concrete slab containing excess moisture leads to catastrophic flooring failure. 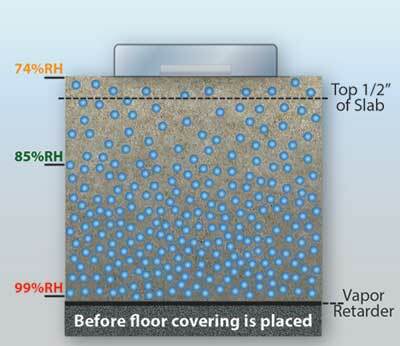 ASTM International notes that floor coverings often fail due to unsuitable moisture levels in the concrete below. If the slab is not given sufficient time to dry to acceptable levels, any of a number of problems can occur. The upshot? Costly repairs, liabilities, and potential of damaging your reputation. Replacing significantly deteriorated flooring can also be very disruptive to businesses, such as industrial, educational, and medical facilities. 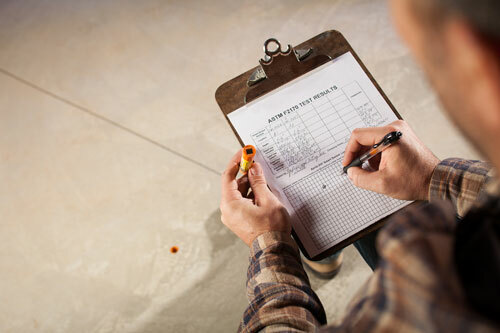 To avoid these consequences, flooring and construction professionals have used a variety of test methods to determine the level of moisture in concrete prior to installing a finished floor product. From the 1940s to the present day, many of them have relied on surface-based methods of testing for moisture. Examples of surface-based tests include anhydrous calcium chloride (CaCl) testing, the hood method, the plastic sheet method, and hand-held moisture meters. A major problem with all of these methods is that they measure moisture at or near the surface only. They fail to take into account the significant moisture that exists deep in the slab, including moisture that will eventually migrate toward the surface. For this reason, they cannot be expected to give a reliable, accurate assessment as to whether the slab has dried sufficiently. RH testing goes back to at least the 1950s and 1960s, with assessment methods developed by the Portland Cement Association. It is also traceable to research conducted at Lund University in Sweden during the 1990s. When drying, prior to finish installation, concrete slabs typically exhibit a moisture gradient, with lower moisture levels near the surface and higher levels toward the bottom of the slab. The RH level at 40% of the slab depth (20% depth when the slab is drying from two sides) gives the truest measurement of the overall moisture condition if the slab were to have a low permeable finish installed at that point in time. 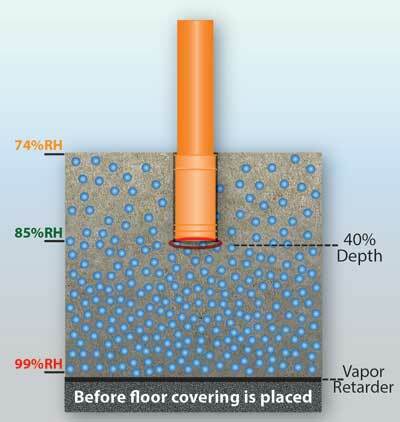 Probes or sensors placed at this depth in the concrete (often called in situ probes) provide accurate and verifiable RH readings of the moisture levels in the concrete slab. These findings – based on verifiable scientific evidence – offer compelling reasons why in situ RH testing, as opposed to surface-based testing, provides industry professionals the best, most accurate assessment of the moisture condition of concrete slabs. Acknowledging the benefits of RH testing in preventing flooring failures, as documented in the Scandinavian research, ASTM International issued a new industry standard in September 2002 – ASTM F2170. Based on the guidelines and recommendations of industry experts, this new standard specifies the proper procedure for conducting an in situ RH concrete assessment in order to get consistent, reliable, and accurate results. The standard has since been updated several times, and is now the only approved standard for lightweight concrete applications. With in situ RH measurement, flooring and construction professionals can expect to receive an accurate picture of overall slab moisture levels, supplying them with the exact information needed to make critical business decisions about flooring installations. One requirement of ASTM F2170 is that you must wait at least 72 hours, after the hole is drilled and lined, prior to recording any test results. This allows ample time for moisture equilibrium to occur within the drilled hole in the concrete. This 72-hour requirement received further evaluation during an ASTM Precision and Bias (P&B) study conducted in 2014, with results published as part of a recent 2016 update to the ASTM F2170 standard. An independent laboratory ran the P&B study. They tested RH probes from six manufacturers and took temperature and RH readings at 1, 2, and 4 hours, as well as 24, 48, and 72 hours. The study showed that RH measurements taken at 24 hours – a full 48 hours ahead of the required 72-hour mark – are essentially the same as the 72-hour readings. While readings were not 100% identical, the variation fell within the acceptable range as specified by the ASTM F2170 standard. A second major finding that came out of the study was that the readings of the various manufacturers’ RH probes gave very similar results. There had been concerns in the past about RH sensor consistency among manufacturers. This study clearly showed that the sensors for the six manufacturers give largely consistent moisture readings when compared to each other. Given this finding, one can now conduct in situ RH testing per ASTM F2170, use any of several manufacturers’ RH probes, and be confident about obtaining valid, reliable readings of the moisture condition in the concrete slab. Based on the findings of the P&B study, we now know that RH measurements taken at 24 hours vs. 72 hours show little or no difference. As such, it does not appear necessary to wait the full 72 hours to obtain a reliable, accurate reading. This conclusion supports consideration of a change to the F2170 standard in which one would need to wait only 24 hours before taking a RH reading. Based on the P&B study, such a change would not be expected to affect the reliability or the accuracy of the RH test. Until such time that a change of this type is made, anyone conducting an in situ RH test must still take official, documentable RH readings at or after the 72-hour mark. Even so, based on the findings of the recent ASTM-commissioned study, readings may be taken 48 hours earlier, at the 24-hour mark, for a reliable indication of the slab’s moisture condition. This would give a 48-hour head start on making project-related decisions. Changing the ASTM F2170 standard to 24 hours would certainly benefit industry professionals in several ways. First and foremost, it would save 48 hours on the testing procedure and allow for quicker, documentable concrete moisture test results with which to make installation decisions. It would also mean that at 24 hours, in the case of an RH reading that is below the moisture threshold for a given flooring product, the finished floor installation could move forward immediately. On the other hand, if RH readings are higher than the maximum allowable moisture threshold for a given flooring product, the process of moisture mitigation could begin immediately, including looking into various alternatives and discussing options with the project team. By being able to implement needed mitigation steps sooner, the “extra” 48 hours could ultimately help achieve a more efficient use of project resources. Either way, the ASTM’s P&B study tells us that RH testing yields valuable, reliable information very quickly, within 24 hours. This is good news for reducing costly delays and potentially enhancing project profitability. Elizabeth V. Rodenkirch, AIA, LEED AP BD +C, works for CTLGroup, focusing on structural and architectural evaluation with an emphasis on sustainability. Her ten years of experience includes condition assessment, forensic analysis, and new and repair design and construction for a wide range of buildings, and air barrier and flooring systems. Her expertise includes issues related to moisture in concrete slabs. She is an active member of ASTM Committee F06 on Resilient Floor Coverings.